Can wind developers and ocean scientists work together to get U.S. offshore wind cranking? Offshore wind power has made landfall in the U.S., and with it, all the tantalizing potential benefits a breezy ocean and some towering blades can bring: reduced use of climate-changing fossil fuels, lower electric bills, energy independence, new jobs, and economic growth. But for these benefits to materialize and help the U.S. kick its fossil fuel habit, wind developers face a number of key challenges. They need to reduce the financial risks, mitigate impacts to animals and the environment, and find ways to accelerate the path to this untapped source of clean energy. This is particularly true during initial siting and construction phases of a wind development project, when questions about possible geological obstructions in the seafloor, noise impacts on whales and other marine animals, and other issues come into play. A lot of things need to go right. The U.S. has been moving towards offshore wind for several years. In 2012, the Bureau of Ocean Energy and Management (BOEM) announced that the country’s first large scale Wind Energy Areas had been put up for auction off the Massachusetts and Rhode Island coasts. The following year, the first two lease blocks, covering roughly 165,000 acres, went up for auction and were sold to Providence, R.I.-based developer Deepwater Wind. Then, Massachusetts legislators passed an energy bill—the Act to Promote Energy Diversity—requiring state utilities to draw on at least 1,600 megawatts of offshore wind energy by 2027. From then on, it was full speed ahead. 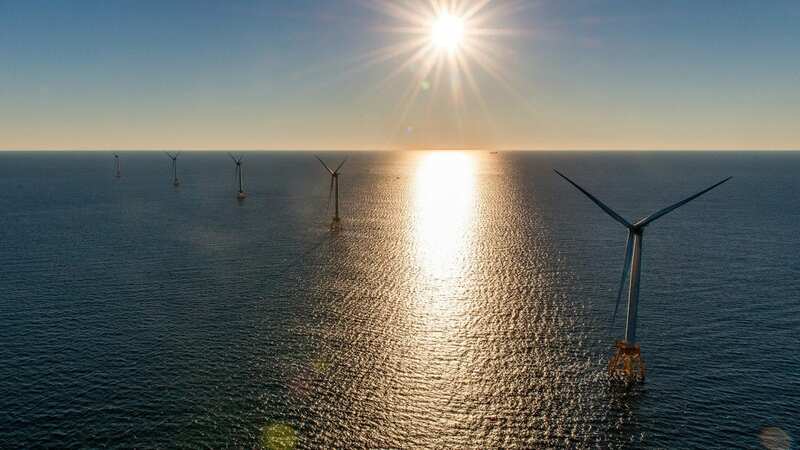 Electric companies in the region began submitting bids for offshore wind projects, and in December, 2016, Deepwater went live with the nation’s first offshore farm—a small facility with just five turbines—off Block Island, RI. Now, developers in the region are starting to go big. Last year, New Bedford, Mass.-based Vineyard Wind nabbed Massachusetts’ first offshore wind contract and is planning to build an 800-megawatt facility consisting of 100 turbines in federal waters south of Martha’s Vineyard. That will generate enough power to supply 250,000 homes and businesses. Deepwater Wind is also planning a second, larger facility that will bring an additional 400 megawatts of power to the region, and other developers are lining up sites and operating contracts for areas up and down the east coast. The burgeoning U.S. offshore wind industry has been cranking since the first turbines started spinning less than two years ago. But it’s in its relative infancy, so the opportunity to develop this massive energy source from the ground up in an efficient and non-impactful way still exists. Offshore developers can go it alone as they race to market, but demonstrating that projects can be conducted with minimal environmental impact and economic risk—a key aspect of the permitting process—is something Kirincich feels could be facilitated through greater collaboration with academia. This includes taking advantage of the best science and tools available, and working with scientists who know the ocean environment inside and out and can act as an objective resource to stakeholders, Kirincich said. It’s blowing 20 knots over a patch of ocean a few miles off the southern tip of Martha’s Vineyard. Kirincich is standing on a coastal observatory 75 feet above the choppy seas on what looks like a Godzilla-sized tripod jutting out of the ocean. The perch provides a sturdy platform for Kirincich and the big white box next to him, which could easily be confused for a dorm fridge. But there’s no beer inside. Rather, it’s loaded with dizzying array of optics that shoot 10,000 laser beams a second into the atmosphere. By zapping the air, the instrument—known as the Wind Cube—measures wind speed and direction up to nearly 700 feet above it. Typically, when offshore developers go through the process of evaluating turbine sites, they mainly pay attention to a potential site’s average or “mean” winds. But more detailed information about wind variability would help qualify the potential energy a site might produce, said Carol Anne Clayson, a scientist at WHOI who studies how the ocean interacts with the atmosphere. This is because even a small increase in wind can cause a large increase in energy. According BOEM, a turbine placed in an area with average wind speed of 16 miles per hour will produce 50 percent more electricity than a site with 14-mile-per-hour winds. “Data on wind conditions in the lower hundred meters of the atmosphere is scarce, so it would be difficult for developers to really understand wind conditions and how the wind is changing over those hundred meters,” said Clayson. But she says that by monitoring this layer of the atmosphere more closely, scientists can learn more about how the wind changes with height under many weather conditions, and feed that information into weather-forecasting models that developers can use. Nils Bolgen, a program director at the Massachusetts Clean Energy Center (MassCEC) which funded the purchase of the Wind Cube, agrees. He says offshore developers don’t just want wind profiles at the base of a turbine—they want to know the conditions up where the wind would be pushing on the turbine blades. “This additional monitoring would help increase the confidence developers have in the wind resource,” he said. No matter how fast the wind blows, all bets are off unless a turbine is stable. Foundations need to be able to deal with the constant flexing of turbines as storm waves and hurricane-force winds pummel them in the open ocean. This is where seabed conditions come into play. He explained that oceanographers have the tools and technical know-how to image the sub-seafloor landscape to ensure that no obstructions are in the way. For example, they use hydrophones towed behind ships to map geological structures at the 5-m scale. But this approach can be modified by using fixed seismometers on the seafloor to achieve the 1-m resolution needed to image obstructions like boulders. Autonomous Underwater Vehicle (AUV) technology, one of WHOI’s core competencies, would be an important part of these higher-resolution approaches. Similar geophysical techniques could also help pinpoint cavities and voids in the sub-seafloor that would make a location unsuitable for a turbine foundation. But then there’s the question of how stable a turbine will be over the long haul, which is arguably just as important to developers as the pre-construction seabed conditions. Lizarralde said this is an area of interest that he and colleagues have only recently begun looking at. Installing offshore wind facilities is a noisy business. When developers pile-drive turbine supports into the seabed, it radiates sound into the ocean that can prevent marine mammals such as whales from communicating with one another. This, in turn, interferes with their ability to locate mates and find food. As a result, developers are under pressure to avoid construction when marine mammals are around. 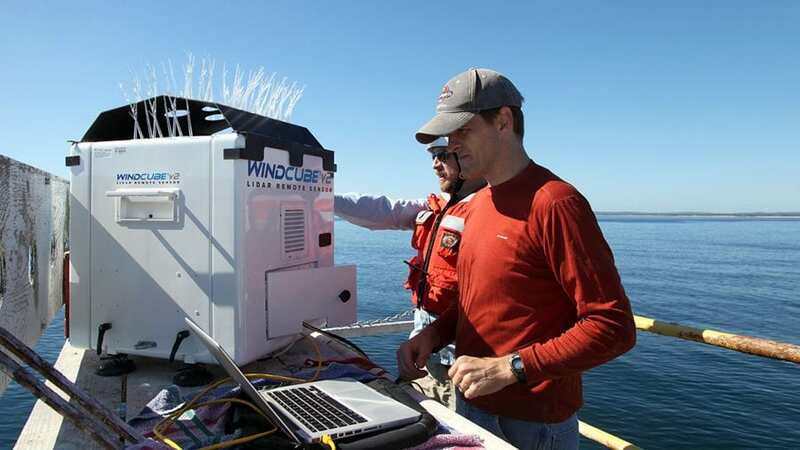 They rely on human observers on boats and planes to scan wind construction areas for the presence of whales, dolphins, seals, and other marine animals. This helps meet guidelines developed by the federal government aimed at mitigating noise-related impacts in the ocean. “It becomes a really expensive proposition for developers to stop pile driving once they’ve started,” said Mark Baumgartner, a marine ecologist at WHOI. Some developers, like Deepwater Wind, voluntarily avoid turbine construction between the months of November and May, when critically endangered North Atlantic right whales are often found in designated wind energy areas. Baumgartner views this as a “great concession to conservation,” but he points out that it doesn’t completely solve the problem: There’s nothing stopping a right whale from unexpectedly showing up in these areas during off-peak months. “It doesn’t reduce the risk to zero,” he said. Baumgartner and other scientists see value in the spotter approach, but believe other tools could be put to use as well. To help guard against unexpected visits, WHOI engineers and Baumgartner developed a tool known as a Digital Acoustic Monitoring (DMON) instrument. It uses a hydrophone mounted on a buoy or autonomous vehicle to listen for the telltale sounds of right whales and other marine mammals underwater. Representations of those sounds, like notes on a page of sheet music, are transmitted in near real time to scientists in the lab, who can examine the sounds the way a conductor reads a score to determine what the sounds are and therefore what species are present. Baumgartner and WHOI engineers hope to work toward a new solution that puts the existing hydrophone technology on wave gliders—surfboard-looking robots that could acoustically monitor a construction area around the clock to determine the position of animals passing by. Offshore wind in the U.S. is moving fast, but Kirincich feels it’s still early enough in the game for developers to leverage the tools and know-how that ocean scientists bring to the table. Ultimately, he hopes all the ocean expertise that scientists can bring to bear can be rolled into a more formalized infrastructure he refers to as an Ocean Test Bed. The idea is to establish a place where scientists and developers can work together to test existing tools and techniques against new ones, and from there, determine which ones should be put into practice on the industry side. WHOI scientist Anthony Kirincich and Matthew Filippelli install an instrument known as a Wind Cube atop WHOI's 76-foot Air-Sea Interaction Tower two miles off Martha's Vineyard, Mass. The Wind Cube emits a laser pulse 10,000 times per second that measures wind speeds between 10 and 200 meters (33 and 656 feet) above it. 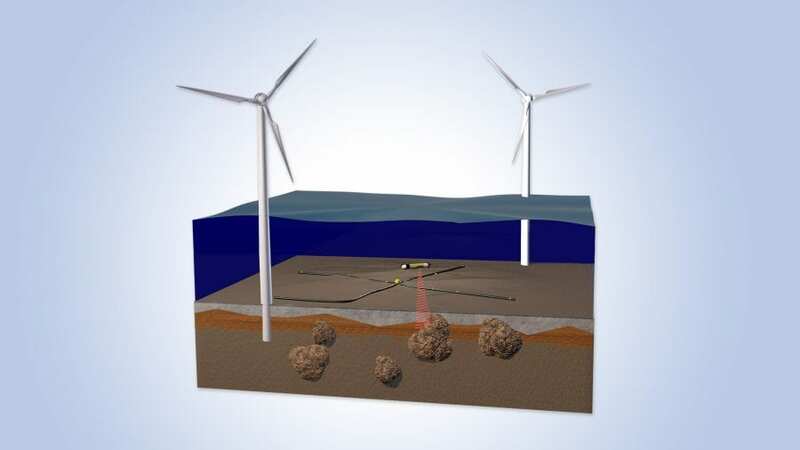 Technology tools routinely used in oceanographic research, such as fixed seismometers on the seafloor and Autonomous Underwater Vehicles (AUVs), could help offshore wind developers detect obstructions like sub seafloor boulders during the turbine construction process.